Mount Rushmore in South Dakota is one of the most famous landmarks of North America and therefore a “must have” for the Wunderland as well. At Miniatur Wunderland, we pass Mount Rushmore with the portraits of the famous presidents on our way from the Grand Canyon to the Rocky Mountains. At the original Mount Rushmore the images of the four American presidents Washington, Jefferson, Roosevelt and Lincoln were blown, chiseled and hammered out of the granite over a span of 14 summers. 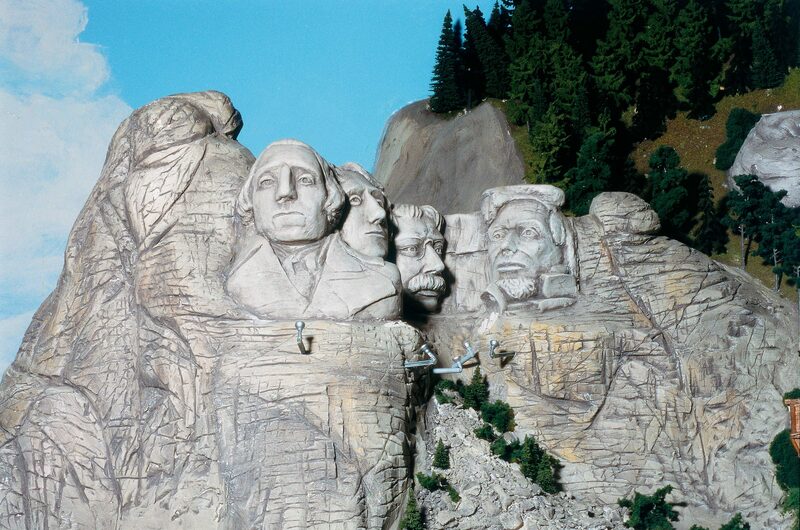 The Wunderland’s replica of these four great American personalities was created more delicately, but nevertheless took many hours of work, their heads being carved into the plaster of the Rocky Mountains.